These incidents are on the rise. However, until now, there haven’t been any solutions to the batteries themselves. The new work, published online November 3, 2014, in the Proceedings of the National Academy of Sciences, offers a simple, cost-effective solution, that, if implemented, could dramatically reduce if not eliminate, this unfortunate problem. Roughly 5 billion “button” batteries are produced, each year, worldwide. These small, disc-shaped batteries, power everything from children’s toys, hearing aids and laser pointers to remote controls and musical greeting cards. While recent legislation requires battery compartments in children’s toys to be secured with screws, many items commonly used by adults contain these batteries in easily accessible formats and their packaging provides no protection. With the increase in these devices and the constant demand for more powerful batteries to power them, the problem of accidental ingestion is increasing. 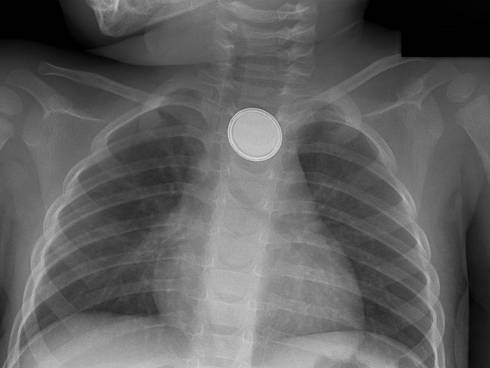 In 2013, there were more than 3,000 reported cases of unintentional battery ingestion, the majority in children under the age of 6. Together with first author Bryan Laulicht, Ph.D., a postdoctoral fellow in Karp’s lab, Karp noticed that when a battery sits within a device, there is gentle pressure applied to it. However, when it is outside the device, this force doesn’t exist. The scientists discovered this unique substance in an unlikely place, touchscreens. Using an off-the-shelf material known as a quantum tunneling composite, they identified a nanoparticle-based coating that, when subjected to pressure, allows an electrical current to pass through. In contrast, it allows no current to run in the absence of such force. The scientists used this material to coat one side of the batteries, covering the negative ends (anodes). To determine the coating’s effectiveness, they teamed up with Traverso, exposing coated and uncoated batteries to gut tissue both in a laboratory dish and in living animals. In all cases, the coated batteries didn’t cause any damage. In addition to reducing injuries, the coating is likely to be inexpensive. “The ultimate cost will depend on the exact composition of the material that is used, but for our current formulation, we’re talking cents, not dollars,” says Laulicht, first author of the paper. That is really great. Anyone who has had a small child around knows they can put just about anything in their mouths. It is really scary! I am so glad someone thought about the safety issue for children! Thanks for the post! I’m glad to know something is being done about those batteries. It’s on of those things that do worry me as a parent. There are so many of items we use that require those button batteries! Me too! When I first saw these batteries I just knew they were a tragedy waiting to happen.They may serve their purpose, but they are one of those things that need some sort of safeguards.